Part of the UC Global Food Initiative, a systemwide effort to address global food needs, the fellowship program aims to support both graduate and undergraduate research promoting food sustainability. To establish the fellowships, the university allocated $7,500 in July to each campus, as well as the Lawrence Berkeley National Laboratory and the Division of Agriculture and Natural Resources. Each campus will offer three fellowships worth $2,500 each. Craig McNamara, president of the California State Board of Food and Agriculture and owner of walnut farm Sierra Orchards, and his wife, Julie McNamara, pledged to donate $7,500 to the program. Alice Waters, owner of Berkeley restaurant Chez Panisse and founder of Berkeley’s Edible Schoolyard Project, as well as Joy Sterling, CEO of Sebastopol-based Iron Horse Vineyards, will each donate $2,500. UC spokesperson Shelly Meron said the UC Office of the President has yet to decide how to allocate the donations to the fellowship program. Waters said she is hopeful that the university will find the best practices in food sustainability and that these practices will filter into school systems and communities and then be adopted around the nation. The global food crisis, the dichotomy in which the world’s population has both chronically undernourished individuals and people fighting obesity, is justification for establishing the food initiative, according to a UC press release. Craig McNamara said the fellowships could be used to address issues such as food waste. Forty percent of food is wasted from farm to table, he added. Sara Cate Jones, summer program manager for the Berkeley Student Organic Gardening Association, said there are not enough funding opportunities for agricultural projects on campus and existing grants do not last long enough for agricultural research. Jones also said she wished that grants for campus organizations would be offered in addition to fellowships. Contact Sophie Mattson at [email protected] and follow her on Twitter @MattsonSophie. 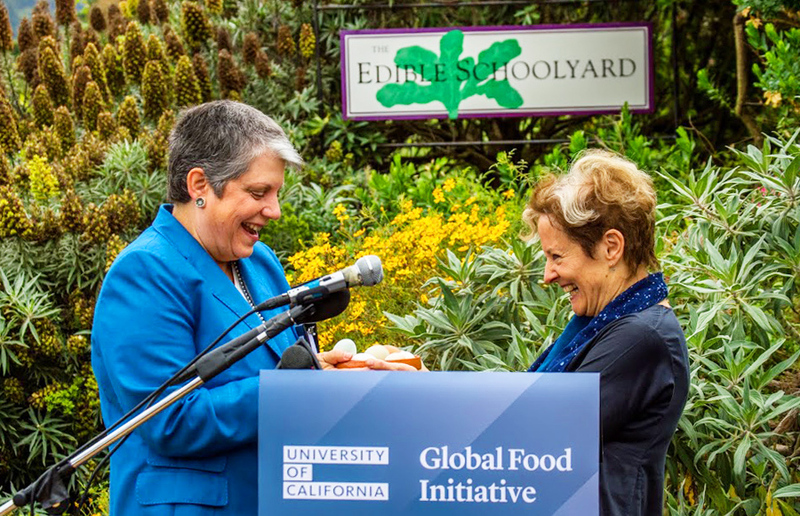 A previous version of this article incorrectly stated that Alice Waters and the Edible Schoolyard Project will each donate $2,500 to the fellowship program. In fact, Alice Waters, as founder of the Edible Schoolyard Project, will donate $2,500.